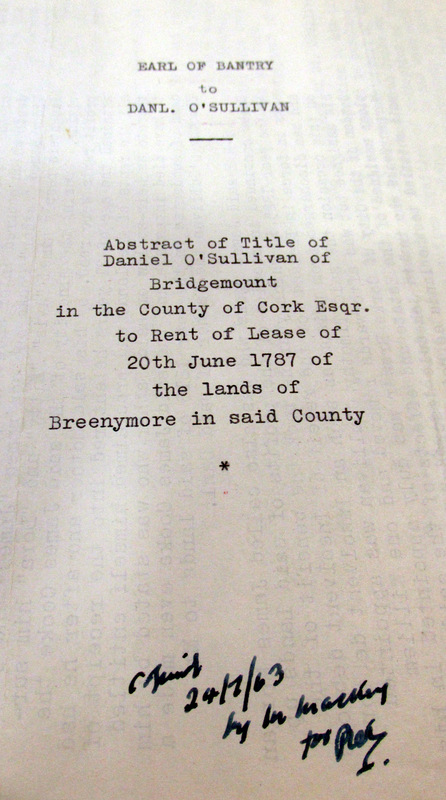 Abstract of Title from the Earl of Bantry to Daniel O’Sullivan, Rents of Brennymore, Kealkil, West Cork, 1787, William O’Sullivan,Esq., Ahill, who bought Carriganass Castle from Mellifonts c 1820 names mentioned James Morgan Cooke, Thomas Stephen Coppinger, Denny Lane, John Barrett O’Sullivan, Norcott Parker, Robert Neville Reaves, and de facto control of Confiscated Lands by O’Sullivan Septs in Bantry/Kenmare Estates in South Kerry, Beara and Bantry areas..
Abstract of Title from the Earl of Bantry to Daniel O’Sullivan, Rents of Brennymore, Kealkil, West Cork, 1787, William O’Sullivan,Esq., Ahill, who bought Carriganass Castle from Mellifonts c 1820 names mentioned James Morgan Cooke, Thomas Stephen Coppinger, Denny Lane, John Barrett O’Sullivan, Norcott Parker, Robert Neville Reaves, and de facto control of Confiscated Lands by O’Sullivan Septs in Bantry/Kenmare Estates in South Kerry, Beara and Bantry areas. The Estate records show a remarkable continuity of O’Sullivans having substantial leases. In the 18th and 19th century branches of the various families appear to have retained de facto control. These families intermarried with similar Catholic families such as the O’Connell of Derrynane, Co. Kerry, the O’Learys, the McCarthys, the O’Donovans and also into the Protestant Gentry families being similar on the social scale. As the Penal Laws were relaxed in the later 18th century they began to serve in the British Military Service and also enter the Legal and other Professional areas. William O’Sullivan Esq., Carriganass Castle. Goodwin YoungHatter, Cork probably from Banty. Obtained judgement 1807 against Simon White Esq., Glengarriff Castle assigned 1825 to William O’Sullivan, Esq., Carriganass Castle, Gave evidence to 1844 Commission Law and practice in respect to the occupation of land in Ireland. Witnesses at Bantry (Rev Christopher Freeman Curate, Richard White Esq. Landlord, Michael Murphy Miller Middleman Donemark, William Neale, Rev. 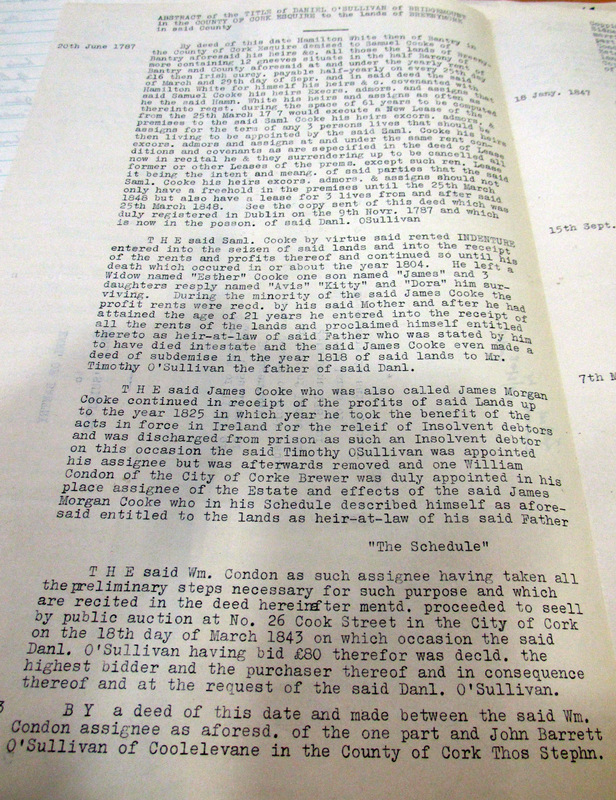 Somers Payne, Land Agent, John O’Connell Esq., Rev. Thomas Barry Parish Priest, Samuel Hutchins Esq. Landlord, Alexander Donovan, Patrick Tobin Farmer Gortavallig Kilcrohane, Timothy Connor, Cornelius Connor, Cornelius Henry Donovan, into Her Majesties Commissioners into The Law and Practice of Occupation of Land in Ireland. 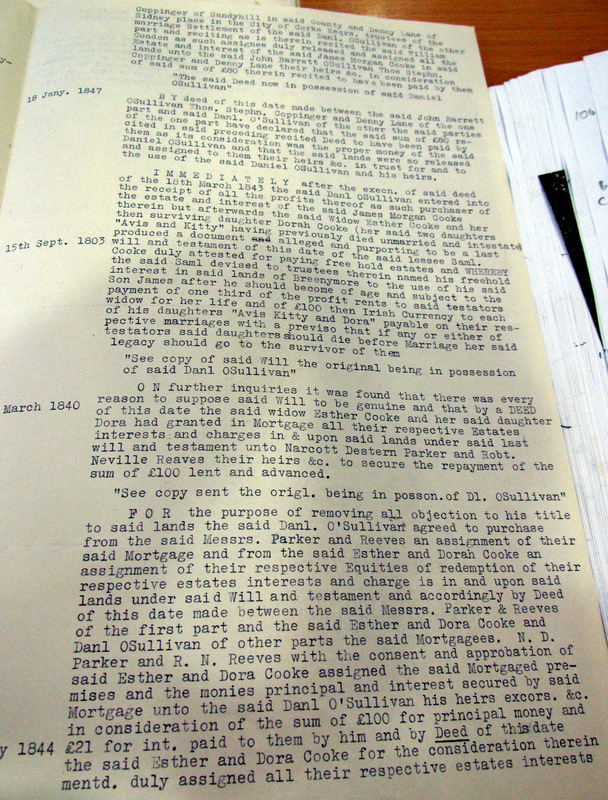 Lease of Ahiel where he was born and in the family for 100 years from Lord Kenmare not renewed in 1840. Has 500 to 600 acres employs a great number of men. Gave evidence to 1844 Commission Law and practice in respect to the occupation of land in Ireland. Head agent to Lord Berehaven son agent to Lord Bantry he was agent to both.